Black tie, sometimes known by its French name cravate noir, is a semi-formal dress code for evening events and social functions derived from British and American costume conventions of the 19th century. Traditionally worn only for events after 7 p.m., black tie is less formal than white tie but more formal than informal or business dress. In the United States, the gentlemen's form of black tie attire is often referred to as a tuxedo. Black Oxford dress shoes or patent leather pumps. A ballgown, evening gown or cocktail dress. Cocktail dresses may be long or moderately short and needn't be black. Smart jumpsuits are also acceptable. When the dinner jacket (tuxedo in American English) first came into fashion in the Victorian era, it was used as a less formal alternative for the tailcoat which men of the upper classes wore every evening. Thus it was worn with the standard accompaniments for the evening tailcoat at the time: matching trousers, white or black waistcoat, white bow tie, white detachable wing-collar formal shirt and black formal shoes. Lapels were often faced or edged in silk or satin in varying widths. Dinner jackets were considered from the first less formal than full dress (cutaway) and etiquette guides declared it inappropriate for wear in mixed company. 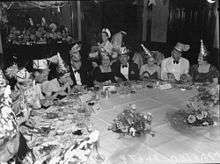 In the decades following World War II, black tie became special occasion attire rather than standard evening wear. In the 1950s, colored and patterned jackets, cummerbunds and bow ties and narrow lapels became very popular; the 1960s and 1970s saw the color palette move from muted to bright day-glow and pastel, as well as ruffled-placket shirts as lapels got wider and piping was revived. The 1980s and 1990s saw a return to nostalgic styles, with black jackets and trousers again becoming nearly universal. In the first decade of the 21st century, midnight blue once again became popular and lapel facings were sometimes reduced to wide edging. Shirt studs and cufflinks. Although it should be noted that some classic etiquette authorities limit studs to stiff-front marcella shirts only and prescribe pearl buttons for soft-front models instead. Alternatively, a fly-front may be substituted. Black tie trousers traditionally have no cuffs (turn-ups in British English) or belt loops. The outer seams are usually decorated with a single braid of silk or a material that matches the lapel facing. Traditionally, braces (suspenders), hidden by the waistcoat, are used to support the pants. Belts should not ever be worn with black tie trousers. Evening trousers can be flat-fronted or pleated today; pleats first coming into fashion in the 1930s. Whilst flat-fronted trousers are more fashionable at present, pleated trousers may be considered more comfortable by men who have wider hips and a narrow waist. A low cut waistcoat (vest in American English) should be worn when wearing a single-breasted coat. The waistcoat plays an important part in black tie's refined minimalism by helping to conceal its working parts by discreetly covering the trouser's exposed waistband and the shirt bosom's bottom edge. Waistcoasts come in the 'V' or rarer 'U' shape, in backless or fully backed versions, double or single breasted, with or without lapels. Single breasted styles typically have three buttons, and double breasted ones three or four rows. Before World War II, while black tie was still gaining acceptance, men would wear a white waistcoat, along with other details now associated primarily with white tie, such as stiff fronted shirts. However, this style, though increasingly viewed as an affectation, is still acceptable in the United States.The waistcoat should be made from either the same fabric as the dinner jacket (traditional) or the same silk as the jacket's lapels (popular). When a waistcoat has lapels, they should be faced in the same silk as those of the jacket; in this case it is considered more refined if the body is made from the same fabric as the jacket. The buttons may be self-faced or covered in the same silk as the lapels. Vintage waistcoats were sometimes closed with studs made from onyx or mother of pearl, which were often surrounded by a setting of silver or gold. A cummerbund may be worn with a dinner jacket in lieu of a waistcoat and, although it is considered slightly less formal, it is equally correct. It looks especially good with a shawl collar dinner jacket but may be worn in conjunction with peak lapels. The material of the cummerbund should be silk satin, grosgrain (or faille), or barathea to match that of the bow tie. It features upward facing folds, which were originally used to store theatre or opera tickets, and are now considered to be more decorative than functional. Just like the waistcoat, cummerbunds are not worn with a double breasted jacket. Although the cummerbund should generally be black, the Black Tie Guide endorses deep and rich colours as a tasteful way to introduce some colour into an outfit that is otherwise monochromatic. Bright colours, such as those often worn by members of wedding parties, should be avoided and the bow tie must remain black in any case. Some higher quality models feature a hidden pocket and an elastic loop to fasten to the trousers. Boutonnière: A flower may be worn. Red and white carnation, blue cornflower, and rosebud have all been popular at times. 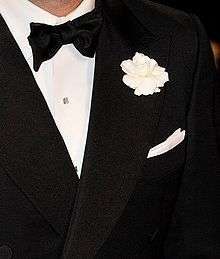 In France, the boutonnière is usually a gardenia, and boutonnières and handkerchiefs are not worn simultaneously. In the last few decades, black tie has been increasingly seen in the United States at formal day wedding in place of the traditional Morning dress. 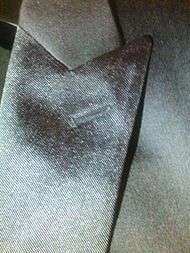 However, etiquette and clothing experts continue to discourage or condemn the wearing of black tie before 7 pm. Prior to the late 1930s, black tie was even discouraged as too informal for evening weddings, with Amy Vanderbilt arguing that "no man should ever be caught in a church in a tuxedo." Indeed, Emily Post would continue to argue in preference of white tie at evening weddings into the 1950s. In England and Wales, black tie is seldom worn at Church weddings or civil ceremonies as morning dress or a lounge suit is normally favoured. However, in recent years black tie is sometimes worn at evening receptions. At Jewish weddings, however, black tie is often stipulated. In Scotland, a dinner jacket is also not common but highland dress is often chosen. Black, or other solid colour, barathea jacket with silver buttons — Regulation Doublet, Prince Charlie (coatee), Brian Boru, Braemar, and black mess jackets are suitable. There is some contention about whether the Duke of Montrose and Sheriffmuir doublets are too formal for black-tie occasions. The Argyll jacket is a popular alternative choice; however, it should be worn with a tree button waistcoat rather than the five button vest. 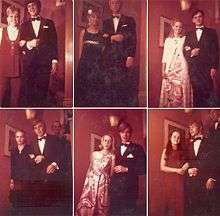 1 2 3 4 5 "Black Tie, Dress Codes, A to H, British Behaviour, Etiquette and Style | Debrett's". www.debretts.com. Retrieved 2016-05-29. ↑ "What Dress to Wear to Black Tie Event". Pepperberry Blog. Pepperberry. Retrieved 16 July 2015. ↑ "Emily Post". Retrieved 23 Jan 2016. ↑ "History: Late Victorian Era". Black Tie Guide. Retrieved 2011-04-01. ↑ "History: Jazz Age". Black Tie Guide. Retrieved 2011-04-01. ↑ "History: Counterculture Era". Black Tie Guide. Retrieved 2011-04-01. 1 2 3 "Classic Black Tie: Shirts". Black Tie Guide. Retrieved 2011-04-01. ↑ Rupert Myers. "It's not elitist to dress up for the opera". the Guardian. ↑ Wyse, Elizabeth (2015). Debrett's Handbook. London, United Kingdom: Debrett's Limited. pp. 417, 429. ISBN 978-0-9929348-1-1.